Curling Canada is thrilled to announce the winners of the contests associated with the inaugural Curling Day in Canada, which made a highly successful debut on Feb. 23. All-expenses-paid closing weekend trip to the 2020 Tim Hortons Brier in Kingston, Ont. – Jill Parsons of St. John’s. Visit by Jeff Stoughton and Nolan Thiessen, with the Tankard Trophy – Unionville Curling Club, Ont. Five $500 cash prizes – Juanita Wannamaker of Gibsons, B.C., Shawn Lukaschuk of Elmwood, Man., Marilyn Tuffords of Unionville, Ont., Matt Christian of Summerside, P.E.I., and Rae Ann Litle of Carleton Place, Ont. 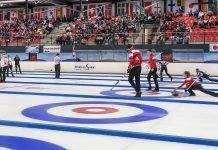 Additionally, with 144 clubs registered to participate in a Canada-wide curling game, and each being asked to send in their top and bottom scores, this coast-to-coast undertaking determined the “top” as the winners with a final recorded score of 7,525 to 6,459 on the bottom. Each of these participating clubs was also invited to collect a $1 donation from each curler that played on Curling Day in Canada to earn a corresponding number of ballots in the draw for a chance to win $10,000 Club Grant. Donations received from this collection, paired with funds generated from the Curling Day in Canada T-shirt campaign, totalled $17,834, which will be invested directly back into youth curling program development and support through the Curling Canada Foundation. With a cumulation of more than 9,200 ballots in the draw, Curling Canada is pleased to announce the Golden Ears Curling Club in Maple Ridge, B.C., as the winner of the $10,000 Club Grant! With appreciation to every curler and curling centre that participated in the nationwide celebration, Curling Canada is already looking forward to a repeat performance for the 2020 Curling Day in Canada.